Barkentin and Krall chalice - £27,500 at JS Auctions. When it comes to antique silverware, the size and weight of objects does not always determine value. Grand works by the likes of London-based Huguenot Paul de Lamerie or the Germain family in Paris have acquired huge status and value, while small objects such as nutmeg graters, early spoons or vesta cases can command high sums as they have a strong specialist collecting base. The system of hallmarking serves as a quality control, giving an official stamp from showing the metal is of requisite purity, but the marks (or punches) also reveal the year, the place of origin and the identity of the maker, providing pieces of silverware with their own stamped passport of information. A charity antiques fair in aid of a Kent hospice will run at the Skinners School in Tunbridge Wells on Sunday, April 28. Having produced only 700-800 works in his short-lived career, Gilbert Marks (1861-1905) is not among the best-known silversmiths of his generation but was considered one of the foremost craftsmen of his day. Silver across five centuries caught the eye at provincial sales in February. ATG’s selection of hammer highlights over the past week include a Henry VIII apostle spoon making ten times estimate at an auction in Leicestershire, and a huge Minton majolica urn bringing similar levels of competition in Ireland. The plethora of single-collection sales at the start of the year was not at the expense of old-fashioned auctions offering good-quality offerings across the range of dealing and collecting – such as the Winter Fine Arts sale at Duke’s (25% buyer’s premium) of Dorchester. The models used in 17th century ceramics were typically derived from contemporary metalwork – and occasionally vice versa. Out-sold by the 100-times estimate £22,000 Japanese vase featured on last week’s News pages (ATG No 2380), this gold and silver-gilt chalice, right, offered at Lytham St Annes auction house Gerrards (18% buyer’s premium) on February 7 was a more predictable five-figure star. The Vogels bought 17th and early 18th century silver from How of Edinburgh, SJ Phillips in London and Shrubsole in New York. The collection of Anne and Frederick Vogel III – for sale at Sotheby’s New York on Saturday – includes not just a stellar array of early American furniture but also a remarkable collection of early English delftware, metalwork, textiles and related vernacular works of art. Auctions on New Year’s Day are a tradition in regional North America. 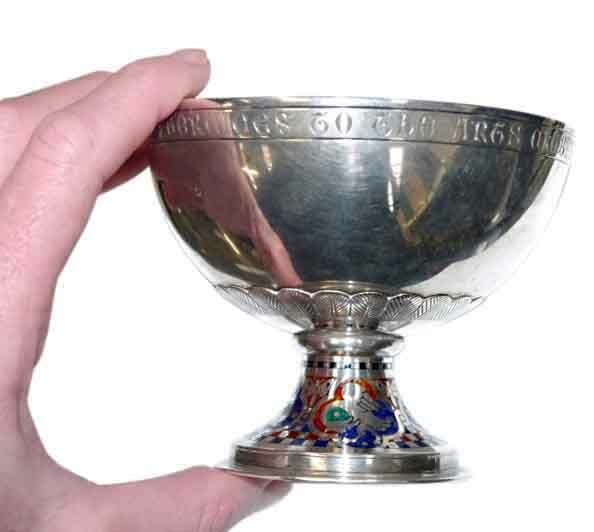 The sale at Nadeau’s in Windsor, Connecticut, on the first day of 2019 included a collection of 17th and 18th century English silver that had been given to Yale University in 1896 in memory of a former alumnus, the Pennsylvania coal baron James Browne Neale. A fine example of a dirk, without which no Highland formal dresswear is complete, was among the stand-out lots at Cuttlestones’ (17.5% buyer’s premium) sale at Penkridge on November 22. The UK’s hallmark for 2019 is a lowercase ‘u’. Even without a ship to sail or servants to summon, bells can be beautiful decorative or collectors’ items.